Display is all about enhancing the objects, without overpowering them. UV-glued, iron-free, toughened glass gives an uninterrupted colour-true view of the exquisite jewelry in this case. Care has been taken to avoid clunky fittings whilst maintaining easy, yet securable, access to the objects. Two upper display panels slide out to provide easy access to a display area of 700 x 1400 x 250mm high. Further storage/display is provided by two shallow drawers within the cabinet. 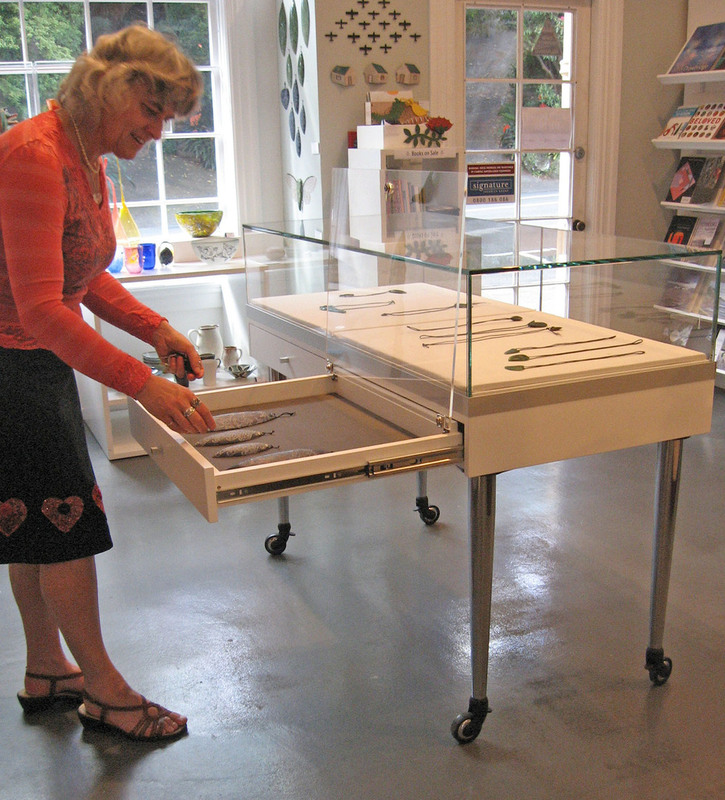 Adjustable sloping shelves display Lopdell House Gallery's beautiful publications to best advantage. The Sustainability Trust helps Wellington households, communities and businesses become more sustainable. 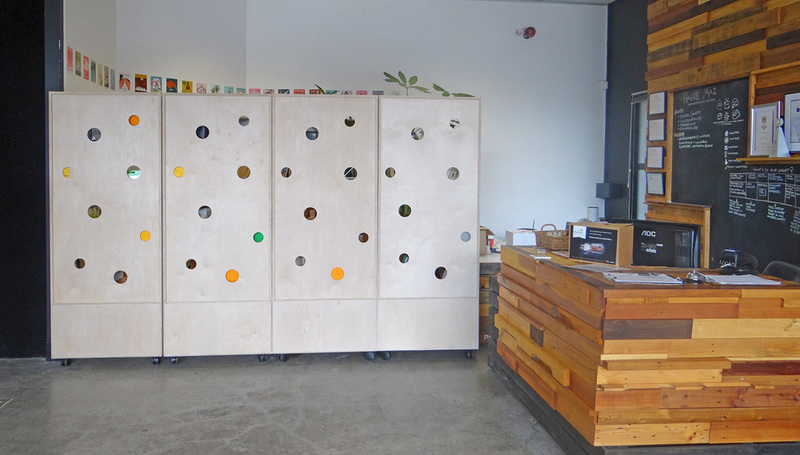 The manager of their EcoShop wanted to move away from the existing chunky recycled pallet furniture towards something more refined and designed, yet still clearly sustainable. Intouch Design sourced FSC certified ply with low shipping miles and designed fixed and mobile shelving. The insides of the shelves where painted white to show off the product, and then a touch of the Company colors were introduced by way of yellow and orange inserted panels. The brief required that the EcoShop be packed away and closed up so the space can be used for events. Intouch designed the mobile cabinets to turn around and wall-off the shop. 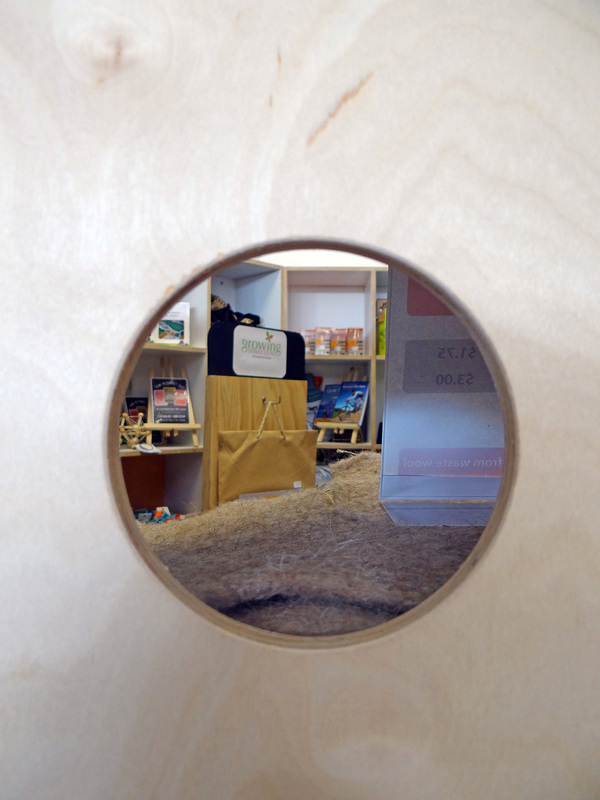 Holes in the back of the cabinet decorate the wall, while allowing little glimpses of the shop. We entered the Whole House Reuse Competition, run by the social enterprise Rekindle. The aim was for artists, architects and designers to make the entire components of a red-zoned house into beautiful and useful new things: a constructive protest about the wasteful demolition following the Christchurch earthquakes. We made a folding trestle table and folding stools, using rimu, galvanized pipe, a wardrobe door, and a mirror, with recycled inner tube for hinges. The furniture folds up so that it fits perfectly in the back of a station wagon. Ideal for taking to the bach! Whole House Reuse was exhibited at the Canterbury Museum, before the pieces went to auction. This is our entry for Round 2 of the competition, using the leftovers. It's a reversal of the earthquake, the fragments coming together to make something new. It is like Brancusi’s endless column, but dematerializing as it goes up, so that the light can come through. The idea started when Juliet’s friend Steve, asked for a CAD drawing of the rhombohedron shown in Durer’s print “Melancolia 1” for his own artwork, and for her to design him a lampstand. Each rhombohedron is assembled from six identical 5-sided shapes. The competition places a limit on the amount of outside material, especially new material that can be used. The light is made from LED strip, inside a tube made from used milk bottles, to diffuse the light. It looks like a fluorescent tube, but it's more sustainable.